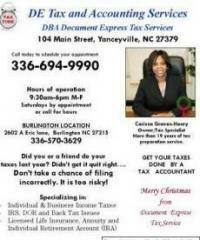 Located at 2602-A Eric Lane Burlington, NC Document Express was established on June 21, 2004. The owner Carissa Graves had a vision to cater to the community using her skills that she had learned in her previous jobs to better serve her community. In January 2007 Document Express opened a office in Yanceyville, NC, and now 9 years later the company is known in the area for its dependable service. Our company makes sure that our customers leave our office satisfied and confident that the job will be done. We specializes in tax preparation, W7 Applications, payroll and bookkeeping. We are opened year around to better assist our clients. We love what we do, and would love to have you as a customer. 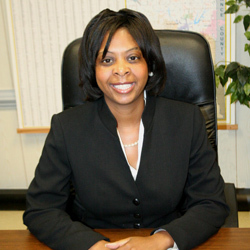 Carissa A. Graves-Henry, the owner of DE Tax and Accounting Services has more than 16 years of Tax Preparation experience and has been in business for more than 10 years. She is a graduate of North Carolina A & T State University (BS in Mechanical and Aerospace Engineering), Florida Coastal School of Law (Juris Doctor of Law) and Walden University with a M.S. in Accounting with an Emphasis on the CPA. She also holds numerous certifications.